Post-race or post-hike, fireside or poolside, get the comfort and support your feet crave that ordinary sandals can’t provide. Superfeet OUTSIDE sandals help absorb impact, while supporting and protecting the foot, so comfort goes with you every step of the way. 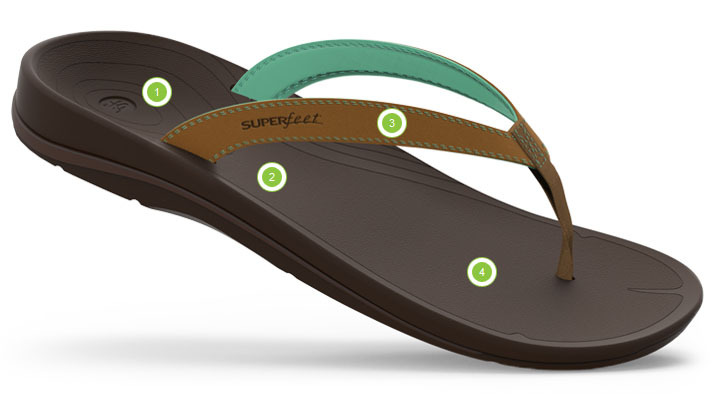 Superfeet OUTSIDE sandals' foam layers work together to cradle your foot, while the distinct Superfeet shape and deep, structured heel cup help to absorb impact and provide support. 1. DEEP HEEL CUP. Helps position the soft tissue to help naturally absorb impact. DESIGNED WITH WOMEN'S SPECIFIC DIMENSIONS. OUTSIDE Women's sandals feature a reduced arch length and narrower heel to better fit a woman's foot. QUICK-DRY STRAP. Quick-dry synthetic leather strap for structure, neoprene for comfort. 4. HIGH-IMPACT TOP. Foot-friendly top layer for long-lasting cushion & comfort. 2. QUICK-DRY STRAP. Quick-dry synthetic leather strap for structure, neoprene for comfort. 3. HIGH-IMPACT TOP. Foot-friendly top layer for long-lasting cushion & comfort.